Well yes there are a large number of notable examples of mice that really only worked with specific machines both electronically and asthetically. One example I can come up with is the Hawley mouse. It is absolutely revolting on terms of ergonomics but it just seems like the kind of thing the "hip" tech crowd would be crawling over to be plugged into their Macbook if they were not already extremely hard to come by. I hope this can be rectified one day by making a 3D printable version. It's literally a box with three rectangular buttons. So I'm walking into this aware that one day the hoard of postpubecent dweebs that make nightly arrangements to clean their shelf of mechanical keyboards and count their inventory of keycaps may one day also descend on the mice of years past and bastardize them like they did with the other. My problem is that I'm not in the mood to plunk at least $1500 down for a Symbolics LISP computer on the pretense that I barely know anything about the hardware. I really wanted something to try it on and if I got bored put the machine away and not waste money. Late in the era of Symbolics they released OpenGenera which is a port of the LISP machine's operating system, but virtualized on Alpha hardware running Tru64. More recently however it was also shadily ported yet again to work on 64-bit versions of Ubuntu. While I may eventually get that running in a VM, for now I'm taking the chance to make use of my AlphaPC 164 system I've let languish for a number of years. While I can only do so much to dress up the PC case and monitor to give a bit more of a Symboolics feel, ignoring the clear issues with the keyboard which we will discuss later the mouse was going to be a challenge. 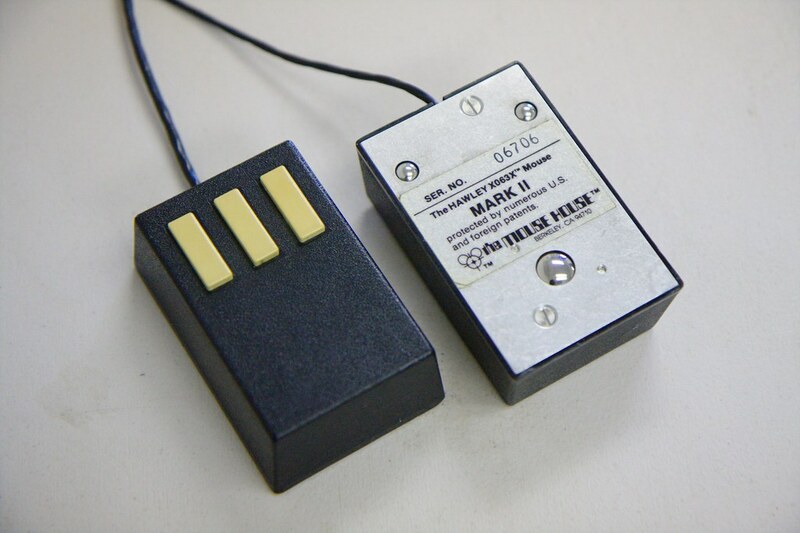 Early versions of the Symbolics hardware used Hawley mice and then later used three button mice OEM'd from Logitech. Logitech typically sold that mouse with either a DB9 or DB25 serial connection. It's possible however that they also sold it as a BUS mouse. 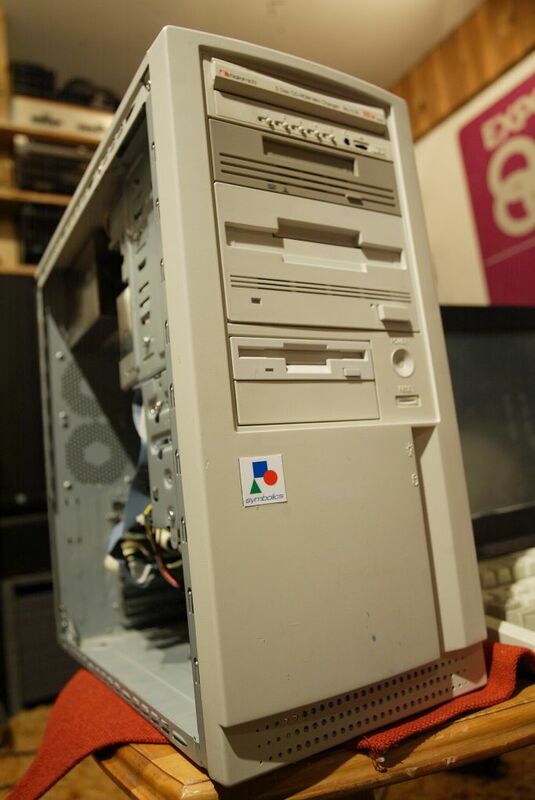 They did not however keep the design once PS/2 became a more common standard and thus because the AlphaPC and Tru64 assumes you have a PS/2 mouse plugged in this would not work for me. Adapters FOR MICE THAT DO NOT ALREADY SUPPORT COMPATIBILITY to go from serial mice to PS/2 computers also seem to not exist. My only real solution was to repurpose an existing mouse. The Hackery is my first place to call for things like this and for not too much money they were able to supply me with a specimen that wasn't too dirty. They also supplied me with a generic three button PS/2 optical mouse which I would use for the rest of the conversion. 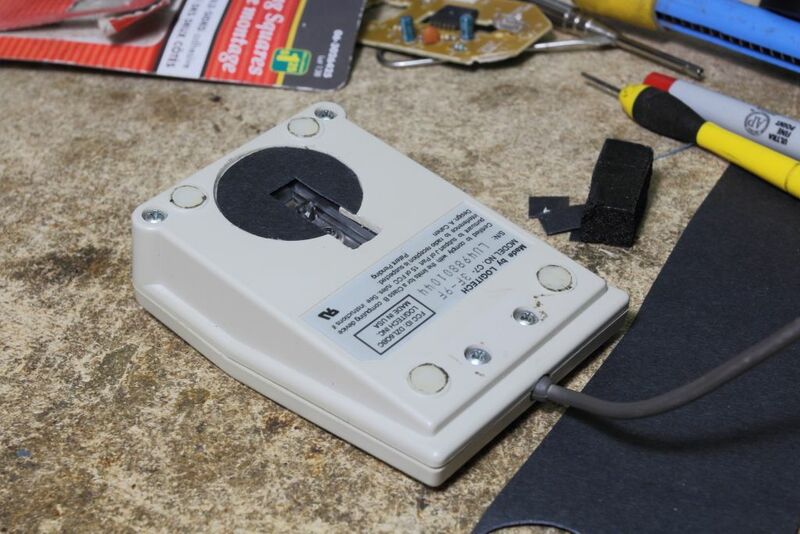 A ball mouse conversion was considered however deemed too difficult as I have to SPECIFICALLY find a mouse that would fit the original opening on the logitech mouse. Anyways yeah, the first thing was to open the mouse and pull everything out. Thankfully everything comes out as one piece so that quickly left me with an empty shell. These parts were put in a small bag and stored with the rest of my spare mice in case I ever needed to repair another Logitech or I decided to convert it back. The optical mouse was also stripped. The first thing that had to be done is to mount the optical assembly. 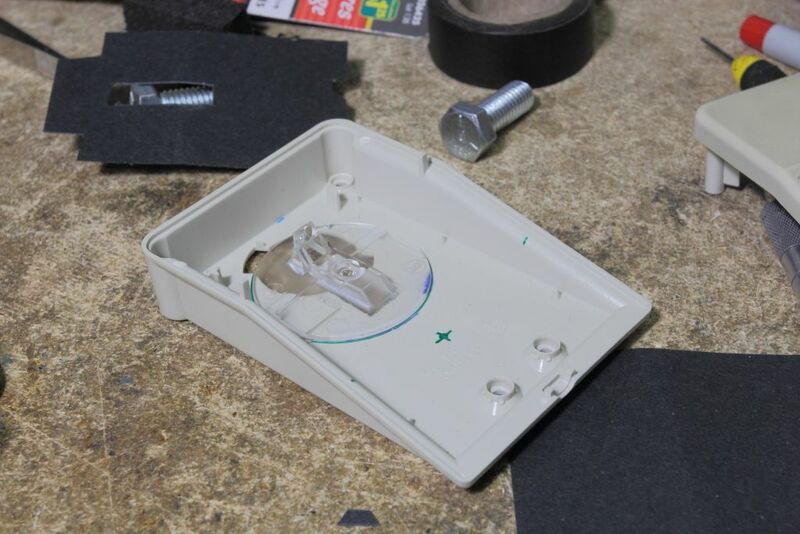 This was the only point where the Logitech had to be cut up so careful attention was made to ensure as little material was removed as necessary, the lens was then glued in place. Two things you have to pay attention to in this case. The first is that the lens sits higher off the ground than it normally is. Some optical mice do not like this. You might have to go through a few mice before you find one that will handle the extra few millimeters. 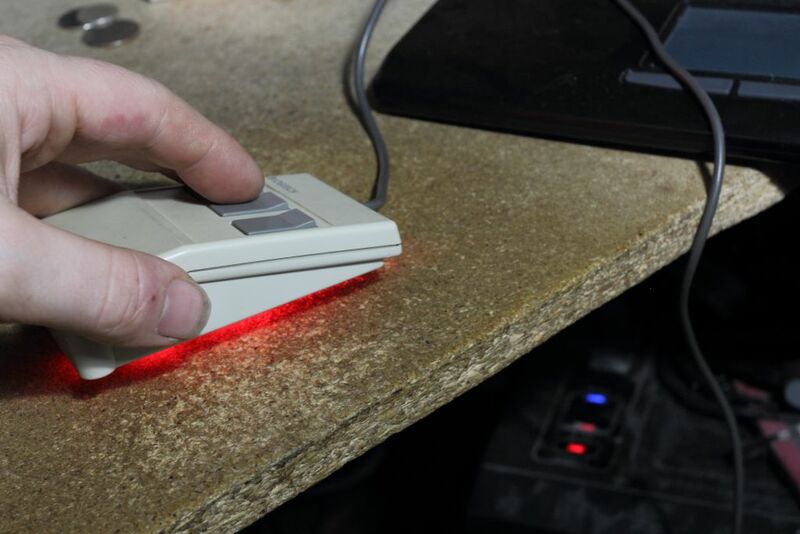 The other is that a red LED in a white plastic shell makes a mouse this old glow. I had to cut a piece of black card paper to fit over the lens to block light going places I did not want it. 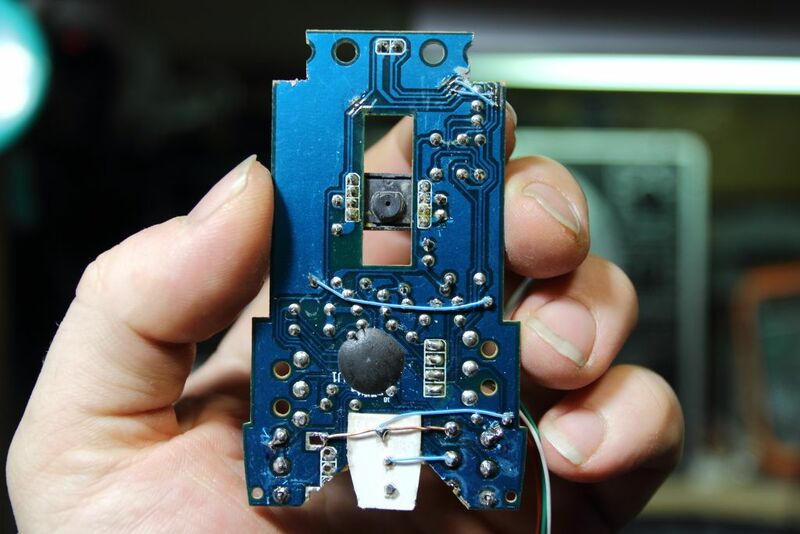 Now comes where we have to make the guts of the optical mouse fit. In my case the mouse required very little modification. The corners had to be trimmed to get around the existing holes for the screws. Because the mice these days are very, very simple devices on a single-sided PCB this meant only three traces had to be rerouted. The button switches were already in the correct locations, just the wrong way around. Buttons 1 and 2 were made to work by switching them around, not soldering a pin on each and solder bridging a normally unused pad to ground. The third button however had no place to mount because a scroll wheel used to be in the way. 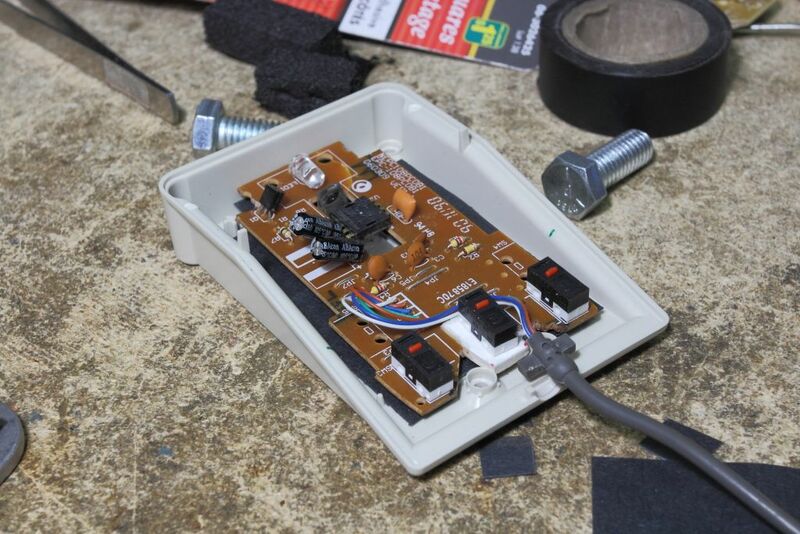 That was removed and then a piece of card paper was glued in and "carefully" had holes drilled for the legs to pass through, then wires were run to connect it to the pads for the third button. 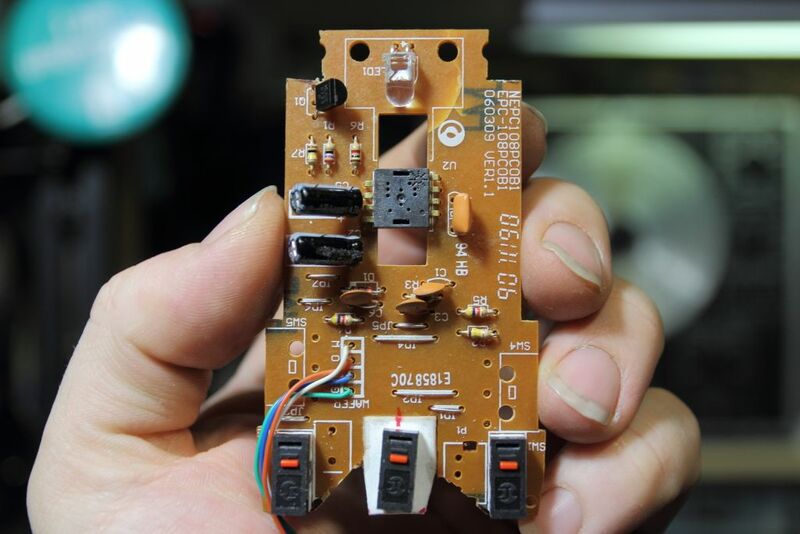 The board was then fitted inside the mouse and hot glued. 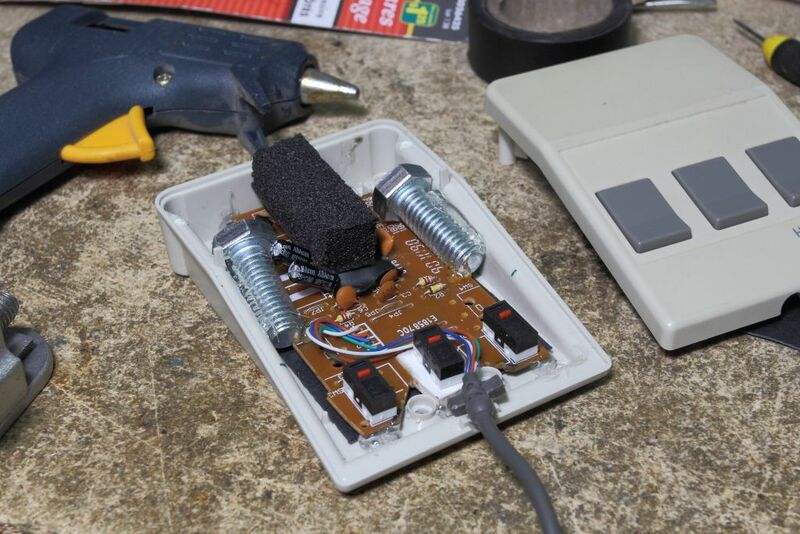 The PS/2 cable for this mouse is not only grey but also has a molded strain relief. This was intentional as a black wire would seem out of place and no strain relief would also seem suspicious. 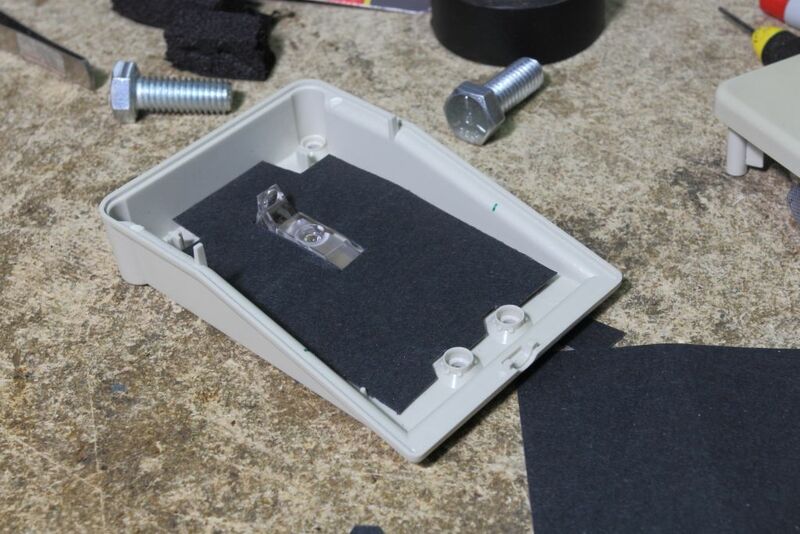 I then covered the top of the optical assembly with black electrical tape and an oversized piece of window foam. Again this is to block the red LED light from lighting up the mouse body. Also at this point here I noticed how much lighter the mouse now was compared to previously. I hot glued in two steel bolts for added weight. I was now able to close up the mouse and screw it back together. To the untrained eye it does not look like anything is amiss. The buttons also have the amount of travel you would of expected from the original mouse as well. Starting with the underside however you begin to notice something is amiss as where you would expect to find the mouse ball there's the path for an optical mouse. To make this look a little less ugly and again to deal with light shining everywhere I cut and glued in another piece of black construction paper. Now really all that was left to do was plug it in and see if it drove me nuts. The answer is no it did not. The glow didn't bleed out anywhere anymore and while it's certainly not something I would spend eight hours a day using it performed well on most surfaces, excluding glass and the teal antistatic mat of one of my desks. So there you have it. 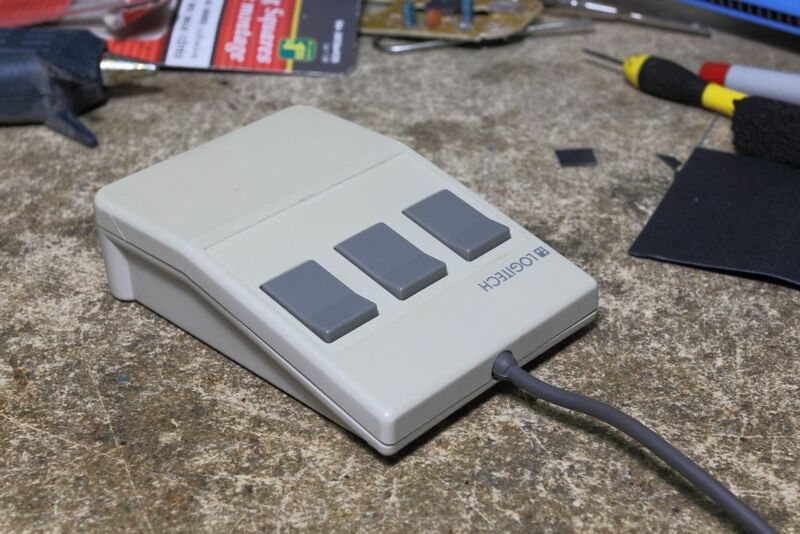 A stealthily converted Logitech three button mouse from serial to optical PS/2, ready for use with my little OpenGenera workstation. So now we come to the keyboard. 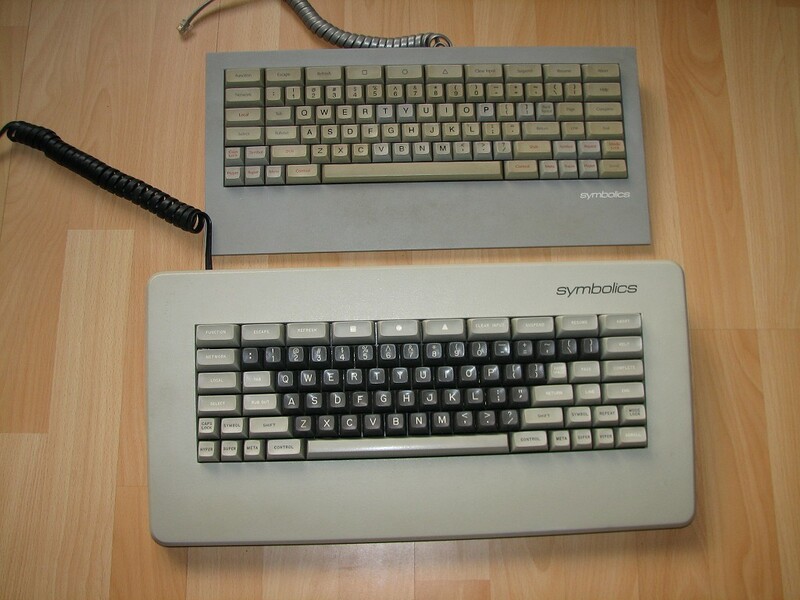 The symbolics keyboard is unique. It has a number of specialty keys specific to functions in Genera/OpenGenera. It is highly suggested you use this keyboard when using either. However for convenience starting with the MacIvory there was both a converter box to allow these keyboards to work with a mac, or if you did not want to use that Genera was nice to remap a number of keys on a conventional keyboard to generate the same functions. In my case however I would rather not use fancy overlays and opt for the keyboard. So here lies my problem. Remember how I took the chance above to slag on folks for their weird and sometimes sexualized obsessions with keyboards? Well these ones are pretty high on the list of must-have keyboards. Something stupid about switches made by Honeywell or just as asinine. Does it really matter? On the open market both the older and newer Symbolics keyboard can fetch hundreds of dollars. 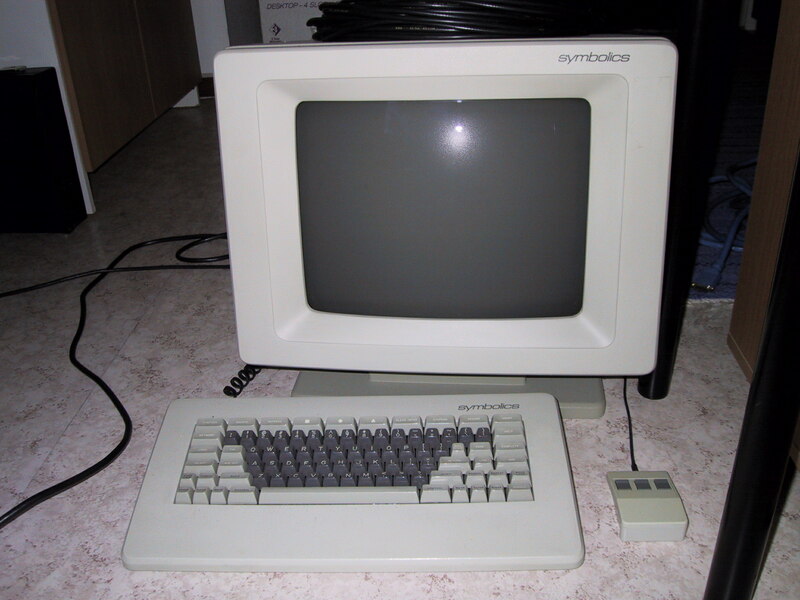 The demand has also nearly stripped the last certified Symbolics parts distributor of their stock as well, who to discourage people taking stock away form people who actually DO need the keyboard for their Symbolics ivory machines and consoles set the price a few hundred dollars higher than the market value. While finding a converter to go to PS/2 will likely be easy, the keyboard at anything deemed "sane" will not. Nice work on the Logitech mouse there!